Is a Rose Press, 9780989624527, 64pp. 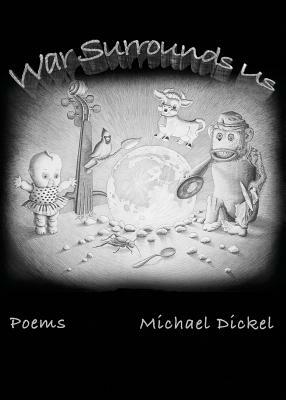 This chapbook by Michael Dickel, chair of the Israel Association of Writers in English, collects poems written during and in response to the Israel-Gaza war in the summer of 2014. The poems evoke a resistance to the violence, and are acute observations of the effects on family and daily life - from the provocations before, through the devastating loss of human life during attacks on Gaza, and past the line of failed cease fires. The incongruence of daily life continuing as war rages is closely observed as the poet witnesses his young son's own response and considers the question of the future we want versus the one that seems to be coming. "Michael Dickel's new bookis an explosive tour de force. From Breaking News to all that shivers beneath the surface, it takes us on a visceral ride as the rockets are falling through screaming surfaces, tunnels cease fires and death tolls; rocketing all night through missiles, mortars, sensors, sirens, shadows and eclipses, shelters and hope. As night slopes through shivers of light, War Surrounds Us will rocket your world with an escalation of unprecedented gravity." -AdeenaKarasick.